June 20, 1782: The Great Seal of the United States is officially adopted. On July 4, 1776, the Continental Congress appointed Benjamin Franklin, John Adams, and Thomas Jefferson to begin the design process to create a national emblem, the Great Seal of the United States. Three different committees submitted ideas for this graphic image of America over the next six years, but none were acceptable. In 1782, Congress turned to Charles Thomson, its trusted Secretary, who kept the minutes of all sessions of Congress and whose journals and files formed the basis for our national archives. Using symbolic elements from all three committees, and adding imagery and mottoes of his own, Thomson created a bold and elegant two-sided design, which he presented as a written description, and Congress approved it that same day. While graphic realizations of the seal may vary from time to time, the design description remains unchanged. • The shield (escutcheon) is composed of thirteen stripes that represent the several states joined into one solid compact, supporting the chief (top section of the shield) which unites the whole and represents Congress. The stripes are kept closely united by the chief and the chief depends upon that union and the strength resulting from it. • The motto E Pluribus Unum alludes to this union. • The shield is born on the breast of an American Eagle without any other supporters to denote that the United States of America ought to rely on their own virtue. • The olive branch and arrows denote the power of peace and war which is exclusively vested in Congress. • The constellation of thirteen stars denotes a new state taking its place and rank among other sovereign powers. • The pyramid signifies strength and duration. • The Eye over it and the motto Annuit Coeptis allude to the many signal interpositions of providence in favor of the American cause. 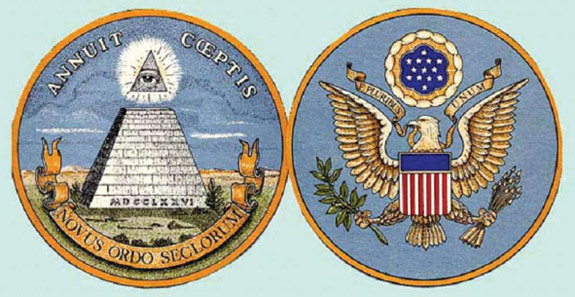 • The date 1776 underneath is that of the Declaration of Independence and the words Novus Ordo Seclorum under it signify the beginning of the new American Era, which commences from that date.